My earlier description of the Matthias Church in Budapest focused on the Exuberant Hungarian interior and skipped the church’s exterior. The late Gothic architecture is largely original, at least in intent. The massive bell tower on the West facade dates to 1470. Late 19th century restorations removed Baroque elements and returned the look of the church to its original design. 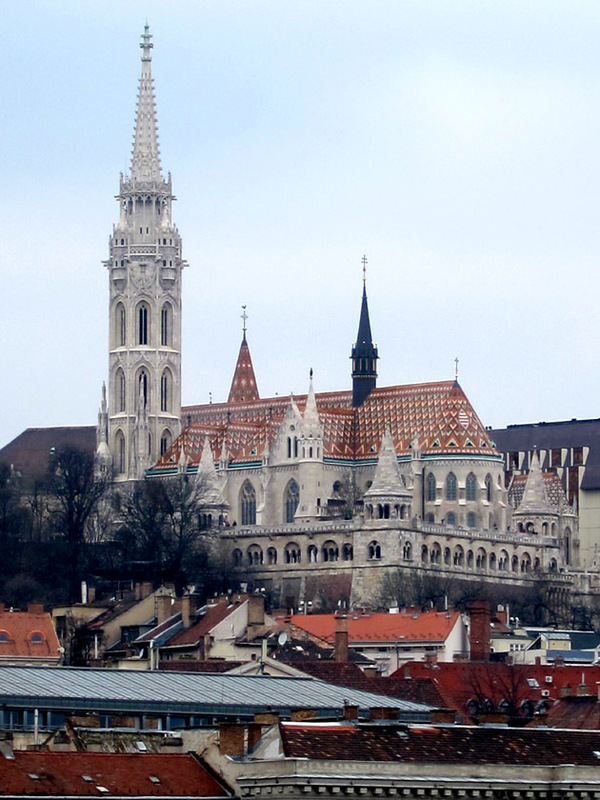 As part of the 1873 – 1896 restoration by Frigyes Schulek, the Matthias Church received a colorful tiled roof. Judging from earlier drawings, the church likely did not not have a patterned tiled roof before. 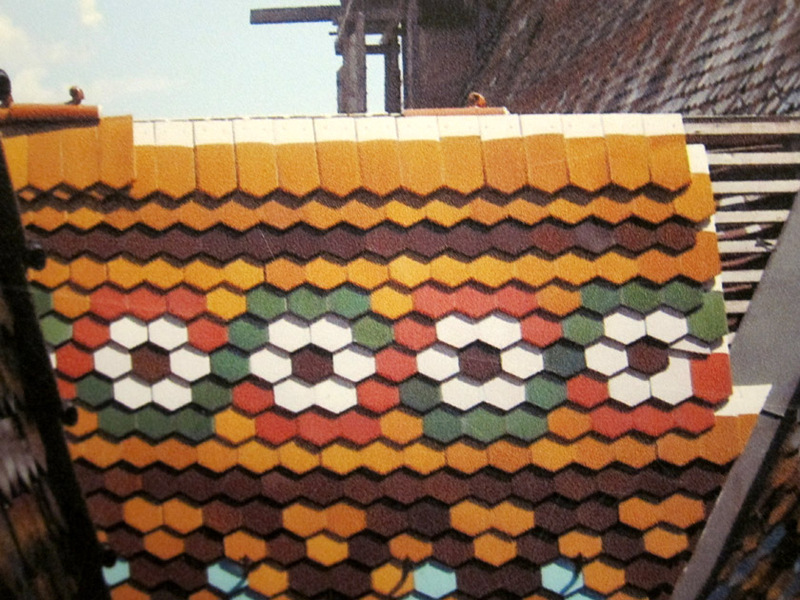 The roof is beautifully decorated in Hungarian Zsolnay tiles of bright orange, brown, green, red, and white. The Zsolnay factory was opened in 1853 in Pecs and produced high quality art ceramics. Since they can withstand cold and hot temperature extremes, you often see these tiles on roofs or as external, decorative elements in Budapest and throughout Hungary. 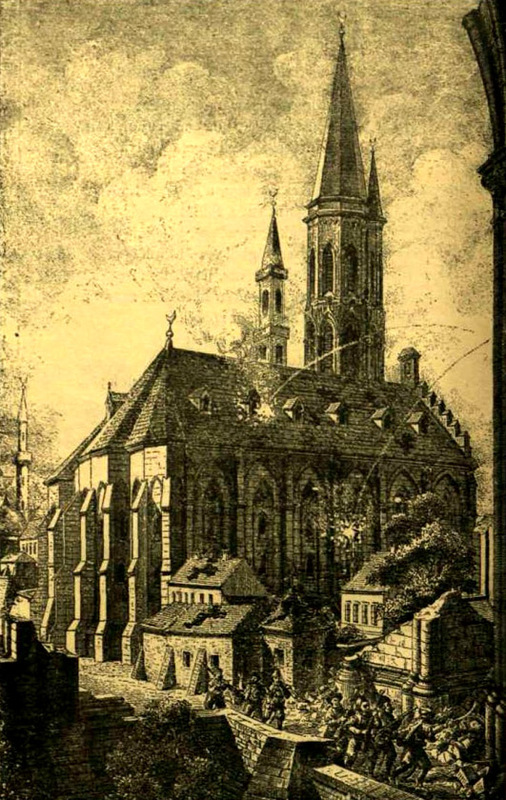 During the siege of Budapest from 1944-45, the Church suffered massive damage. The roof almost completely burned down and other many of the remaining portions caved in. Following World War II, the building was condemned and slated for demolition. Despite persecution of the Catholic Church at the time, the Communist state government started rebuilding Matthias Church. The new roof was completed in the 1950’s but was not done properly so that by the 1990’s water was leaking into the church and damaging that gloriously beautiful interior. This photo shows the restoration in progress. You can see the shape of the individual tiles used on the roof of Matthias Church. From 2006-2013, the church underwent another massive restoration. The roof was completely redone to correct poorly repaired structural elements. Damaged by 20th century pollution and already of a somewhat lesser quality (the government took over the Zsolnay factory in the 1950’s), the old tiles were removed and replaced with a whole new set of decorative tiles. Approximately 2,500 square meters of roof tiles were installed which translates to 149,500 individual ceramic pieces! Today this brightly colored roof is visible throughout the city and remains a treasured landmark. In my travels, I’ve been to a lot of restored archaeological sites but haven’t really considered what is done with the material that is removed. 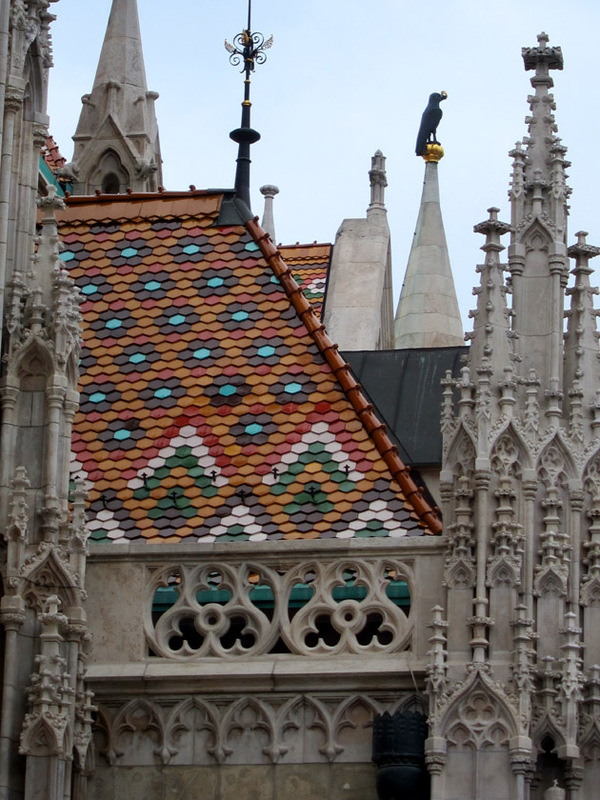 For the Matthias Church, the reconstruction team was left with over one hundred thousand old roof tiles. Their solution was genius. The Church gift shop now sells the old tiles. Each one is individually numbered and comes with authentication. These tiles are predominantly from the 1950’s reconstruction, but according to the store clerk, the occasional “older” tile pops up. Matthias roof tile wrapped up in its cardboard package. 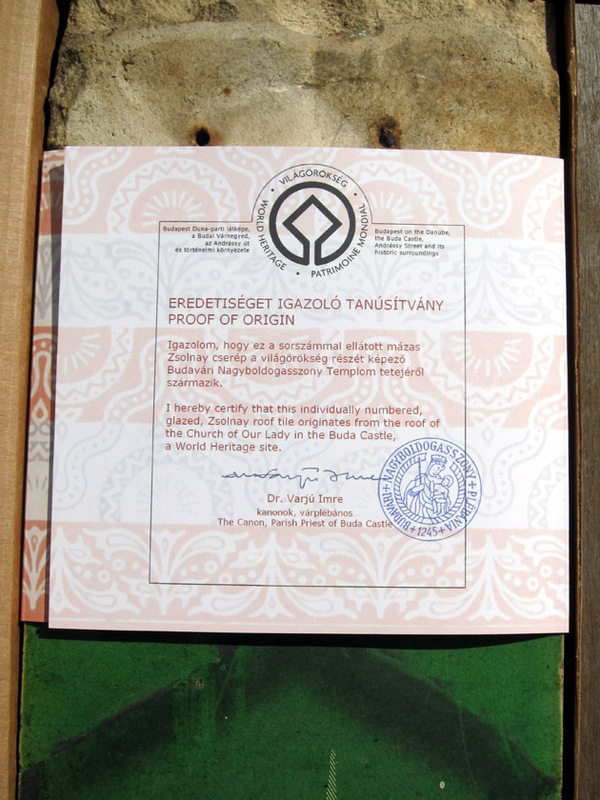 Official certification that comes with a Matthias Church tile. 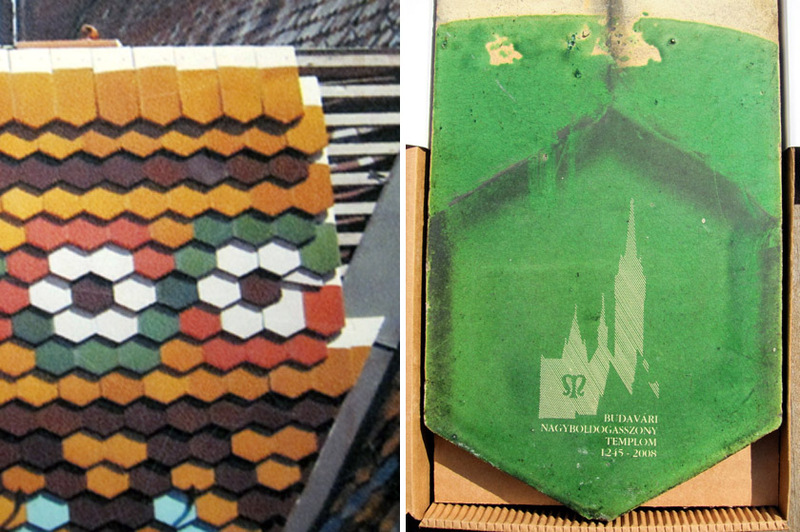 The tiles were on sale for 3750 Hungarian Forints, or approximately $12.50 at the time. Adorably, the blue tiles were a little more expensive (about $15) because there were fewer available. At that price, I definitely had to get one! I actually thought the green color was the best so that’s what I got. The glazing along the tile edge is thin. There is also some chipping from use. The tile itself looks like it was quickly made. The edges aren’t perfect and and have been chipped a bit. There is also some variation in the colored glazing (but also some gorgeous crazing). Although considering that a lot of these had to be made and no one was ever going to look at them very closely, I can see why the tiles aren’t perfect. The tile was fastened to the roof very simply. 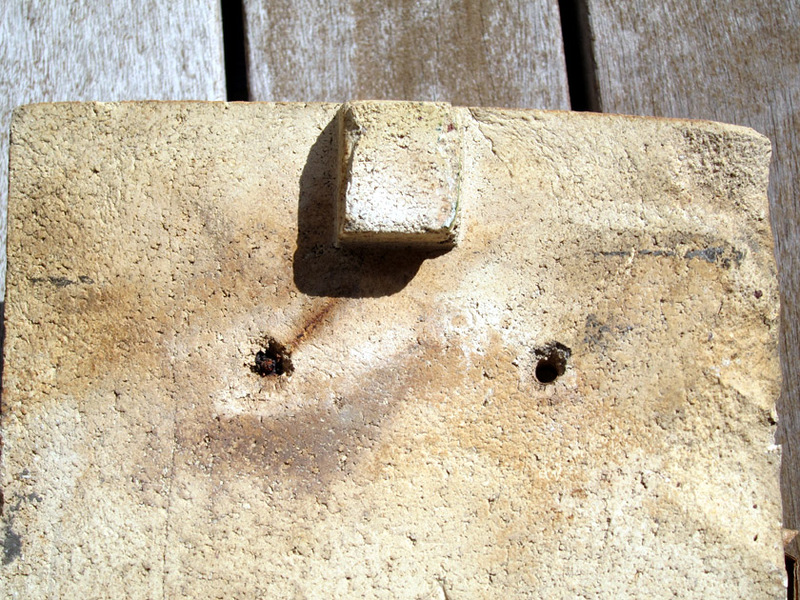 There is a ceramic peg jutting off that helped sit the tile in place. Then it was fasten to the roof with wire through two small holes. You can really see the pollution stains on the tile. The portion that was once visible has been etched with an outline of the church. I like that the tile is dirty. You can see traces of pollution and soot along where it would have overlapped with other tiles on the roof. I actually rubbed off some of the soot off my tile (along the upper left edge) while checking to see how well it was on there. I think you could probably clean it off, but I’m going to leave it as it is. 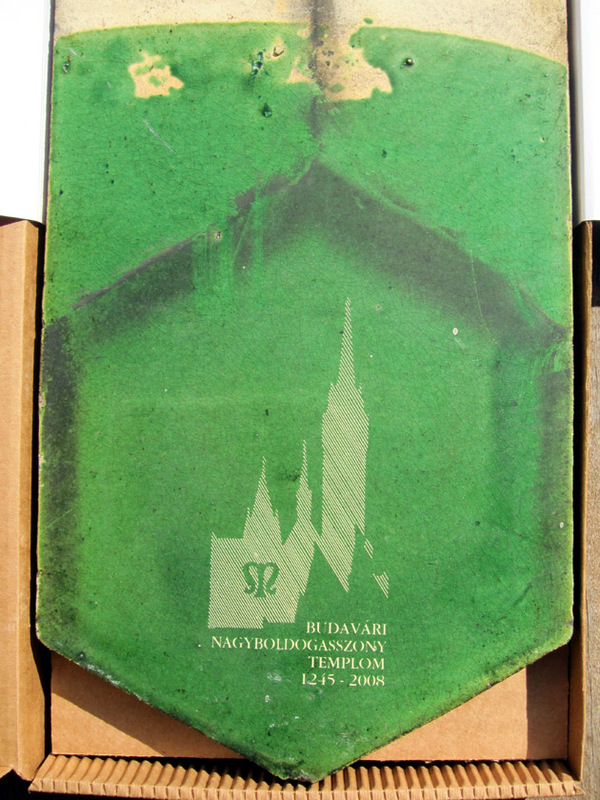 Matthias Church tiles and my green tile – a little piece of the church I could take home. 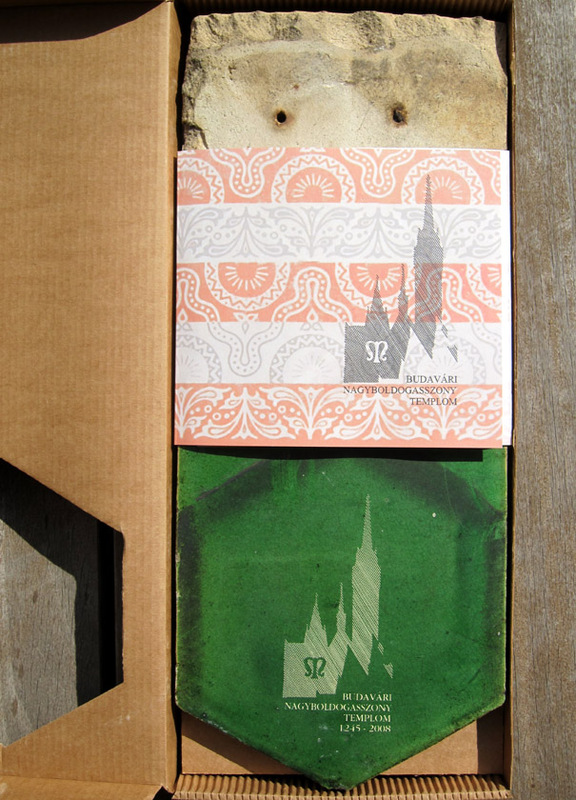 So there’s how I found the perfect souvenir for an art and culture traveler like me. 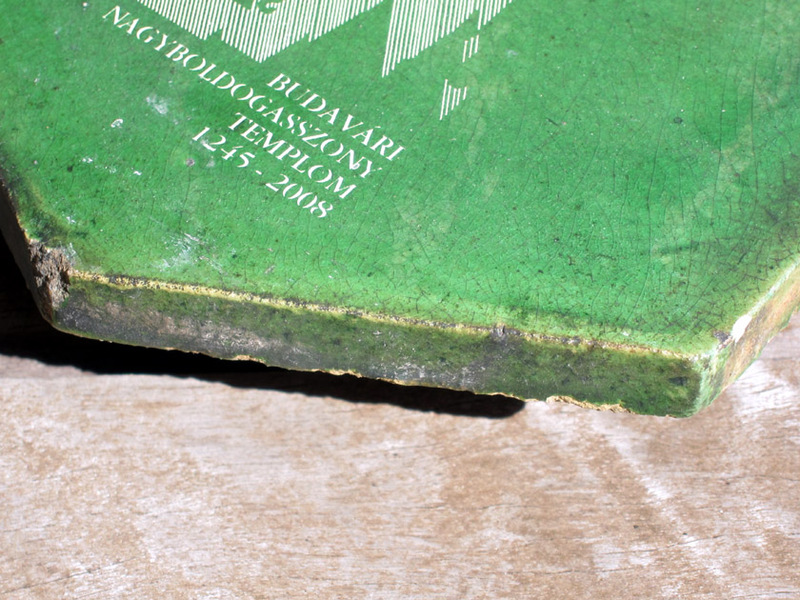 This tile saw a lot of history if it watched over Budapest from approximately 1950-2010! It’s a precious addition to my little art collection and has an amazing story. I’m glad that the tiles removed during restoration could find a new life with the residents and visitors who so admire the beautiful Matthias Church. Whoa, what?! I really wish I’d gone in that gift shop! What an amazing souvenir! !